In Russia, Space Ride For U.S. Spurs Nostalgia, Hope With the conclusion of NASA's space shuttle program, American astronauts will rely solely on the Russian Soyuz spacecraft to reach orbit. Many Russians see this as an opportunity to create a smooth, collaborative future between Russia and the U.S. But not everyone sees it that way. 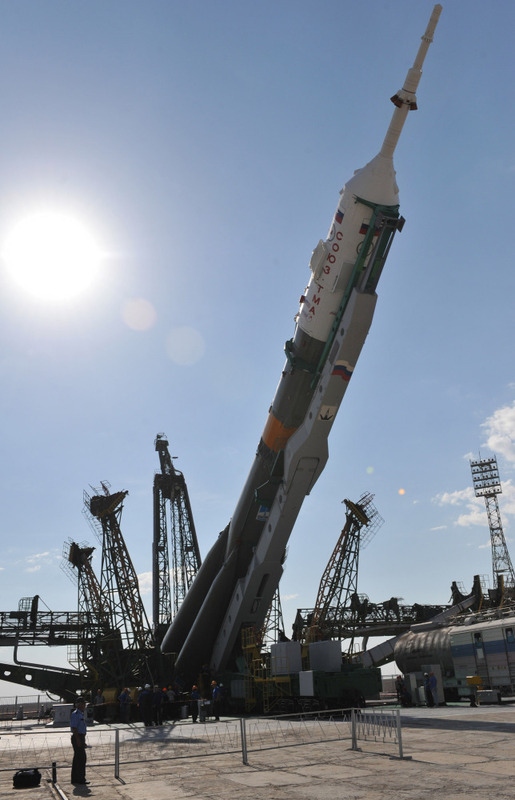 A Russian Soyuz rocket is mounted at a launchpad on June 5. "After this mission, we will no longer have the ability to send American astronauts into space ourselves," Chiao said. "And arguably, we will no longer be the leaders in human space flight until we get that capability back." Arguably, the leader in space flight will, for now, be Russia. 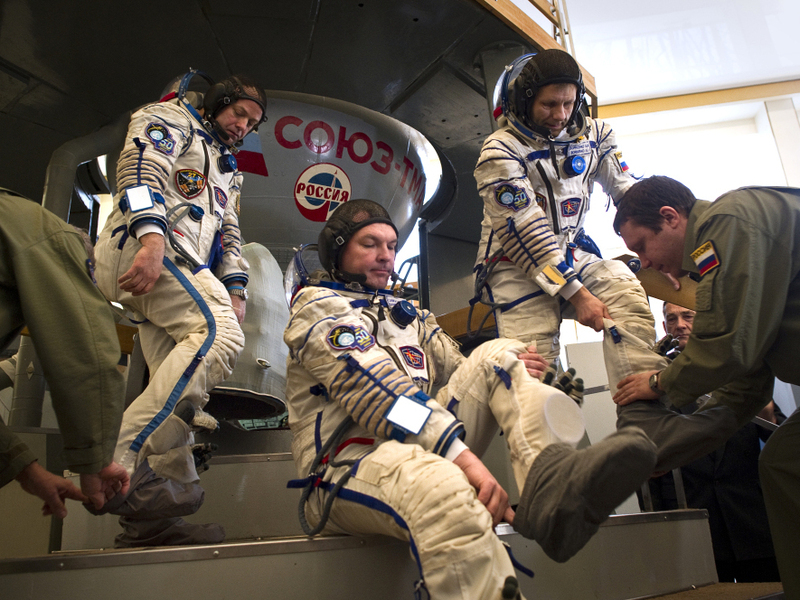 American astronauts will rely solely on the Russian Soyuz spacecraft to reach orbit. After years of space rivalry between the two sides, this might seem like a time for Russians to feel pride. But not all Russians see it that way. On April 12, 1961, five days before the Bay of Pigs invasion, Yuri Gagarin became the first man in space. "American prestige was jolted as the world heard the quickened pulse of Vostok 1 orbiting the Earth," Walter Cronkite recalled. Gagarin got a hero's welcome in Moscow's Red Square — he had given the Soviets the lead in the space race. Five decades later, a towering statue of the man stands in south Moscow's Yuri Gagarin Square. "People call it 'the penguin' because if you look, it looks like a penguin," says Yuri Karash, who has studied and written about Russian space policy for years. He remembers how Gagarin's adventure gave citizens a feeling that their sacrifice for the state was worth it. "America could not do it, OK? Western Europe could not do it. No other country in the world could do it," Karash says. "But the Soviet state could." Crew members of the International Space Station — (from left) U.S. astronaut Ron Garan and Russian cosmonauts Alexander Samokutyaev and Andrei Borisenko — prepare to enter a Soyuz simulator outside Moscow on March 30. With the space shuttle program out of commission, the Russian Soyuz vehicle will be the only way for Americans to reach space. Today feels different. Yes, the U.S. shuttle program is ending and Americans will depend on Russian technology. But many Russians sound melancholy. They believe it won't be long before the U.S. develops a new spacecraft that will beat anything Russia has. Karash captures the sentiment this way: What if a Mercedes broke down in the desert? The driver would find another reliable ride, until he got his hands on a new Mercedes. "So you suddenly see a Bedouin riding a camel on the shoulder and you ask him, 'Hey, guy, do me a favor, give me a lift to someplace.' And he says, 'No problem. Pay me $63 million and I'll take you there.' Does it mean camel is better than Mercedes?" Just a few steps away from Gagarin's statue is a little mall that is full of vendors who sell things such as carpets and kitchen supplies. The people who work in the mall walk past the statue of the Soviet space hero every day. For 38-year-old Igor Malashkevich, who sells tools in the mall, the glory embodied in that statue has faded. On the world stage today, he feels like Russia is weaker than during Soviet times. He says his country needs more respect from the U.S. Maybe, he says, carrying Americans to space is Russia's opportunity. "I don't think there is something we can be proud of about it, because we are dependent on the States in many other ways and many respects," Malashkevich says. This kind of talk is not uncommon in Russia today. After feeling technologically superior in Soviet times, today, some Russians feel their military is in disrepair, scientists are cash-strapped and the space program has fallen behind. Vera Kuznetsova, who sells kitchen supplies, was born the year Gagarin made that first orbit. A statue of Russian cosmonaut Yuri Gagarin is unveiled in London on Thursday, as Gagarin's daughter, Elena (left) and Britain's Prince Michael of Kent look on. Gagarin became the first man in space April 12, 1961, as he orbited Earth. "We were first and could not be beaten," she said. "But that was the Soviet Union." She feels her country now lags behind in science and technology, but adds that she's happy her country is no longer feared by the West. 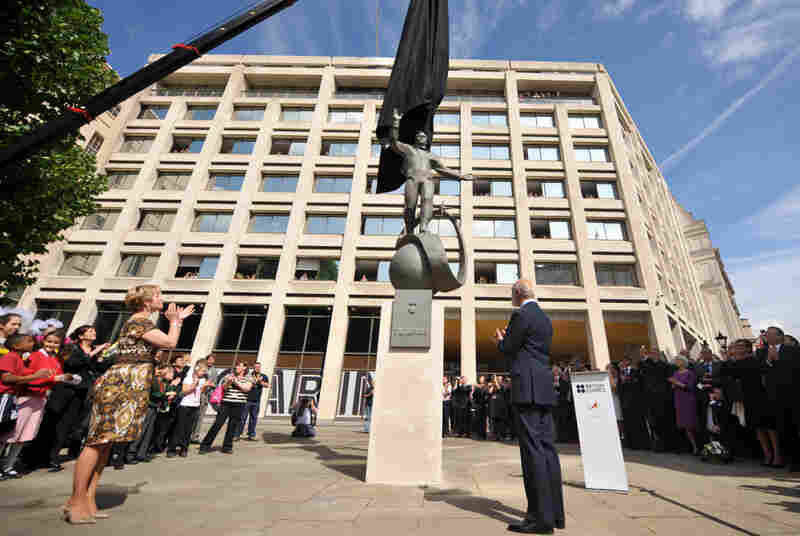 That was the theme Thursday when a new statue of Gagarin was unveiled — not in Moscow, but in London, near Buckingham Palace, right by a statue of the great British explorer James Cook. Sergei Krikalyov, who heads Russia's Gagarin Center for Cosmonaut Training, was there for the unveiling. He called the setting appropriate. "Captain Cook, who was a navigator on Earth, and Gagarin, who was first navigator outside our planet, are standing looking at each other. I think it's very symbolic," Krikalyov says. It's a symbol, he said, that Russia is no longer a rival to the West, but a friend — and a reliable ride into space.